As much of the nation is covered with fall colors, it’s time to reflect back on the summer and thank God for His many blessings. Blessings that came in the form of individuals and teams that come to Nicaragua to work beside us. Hard working and sacrificial, you gave your greatest gift, yourself! You accomplished so much and blessed so many. You built homes, you built a church, you fed children, you consoled orphans, you blessed our employees, you started businesses, you disciple children, you clothed the naked, you ministered to people with God’s healing touch, you led people to Christ, you gave people hope and you changed lives! With so many teams, there are many stories to tell. While we could write about the goodness of God as He worked through any of them, we’ve chosen to highlight the week we hosted Cedar Shoals Baptist Church. 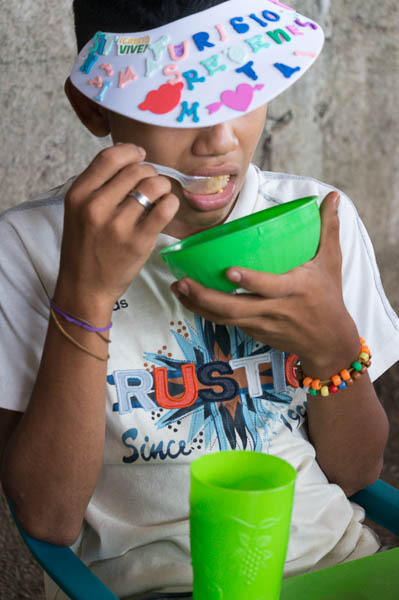 They spent time in Cristo Rey and New Life’s orphanage. Our week started in Cristo Rey working with our ministry partners, Casa del Rey. One of Pastor Carlos’ dreams has been to build out the front wall and put doors on the church. Many nights, he lay awake trying to protect the church from thieves and vandals. We are grateful to God that we were able to make that dream come true for Pastor Carlos and the community of believers at Casa del Rey. The team bought the materials and built the wall and put up the doors. What a difference that has made for the church. Sleep well Pastor Carlos. 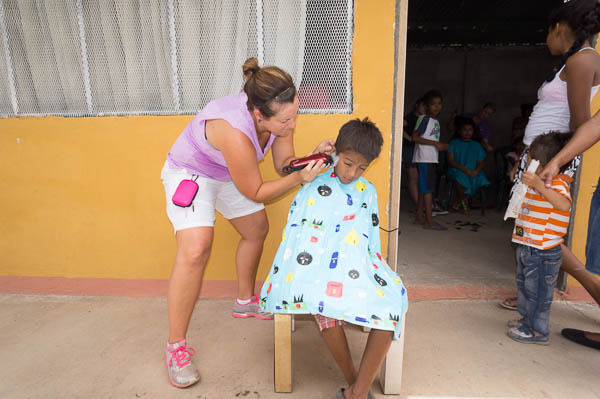 A couple of the ladies on the team brought hair styling kits thinking they would give simple haircuts to people if they wanted it, but the Lord turned it into much more. Some of the ladies of the church came forward and wanted to learn how to cut and style. So in the end it became a teaching lesson, and we now have more styling kits on the way. This will be an excellent way for these ladies to help provide for their families and as part of the micro-program they will teach others what they have learned, the same way they do in the sewing program. We love sustainable ministry—it’s very empowering to those that participate. Before we knew it our whole little styling class turned into a complete makeover station. Children and families came in from the dump and all over the community, and with tears flowing down their cheeks, the team members washed their feet, bathed and clothed them. It was very emotional watching all of this happen. You could see it on their faces what was going on; the team was washing the outside and Lord was washing the inside. They also visited families in their homes and prayed for their needs. Several families came to the church and some prayed to receive Christ into their lives. I think Pastor Stephen told me over 100 people accepted Christ that week. On Friday, Darling, one of the volunteers at the church gave a beautiful testimony. Some months prior she had abdominal surgery. She was experiencing severe pain and discomfort ever since. She had an ultrasound to determine what was wrong, but they didn’t find anything. The team prayed for her, and a little while later in the same day, a piece of surgical wire began to make its way out of the surgery site. She was just so excited and giving praise to the Lord for healing her. That got me excited. I want to see more miracles! The team also accomplished a lot at the orphanage. Picking up where our Cincinnati and New Jersey teams left off, Cedar Shoals painted the entire exterior of the orphanage in one day. Then, on the last day, in what was the most poignant moment of the week, the team came to the orphanage to dedicate a plaque to honor the memory of Rhonda Rhodes. Rhonda had recently lost her life but gained all of eternity. A dedicated and tireless worker for the Kingdom, Rhonda was once scheduled to come to Nicaragua but her disease prevented her from coming. Now, the plaque that honors her memory hangs in our orphanage within the sound of laughing children. Way to go Cedar Shoals. God worked mightily through you all and accomplished more than I could have hoped for. All in all, a spectacular week in ministry. But honestly, it was like that with every team this year. So many stories I just don’t have space to tell you all of them. Well, OK, maybe one more. Our friends from Fellowship Baptist Church came earlier in the summer and built a home for a very sweet and humble lady. As we were talking with her she told us that she had 3 children but only 2 of them lived with her. Her smallest child was living in Managua with relatives because her house wasn’t fit for a little one. When I saw her house, I understood. I tried not to act overwhelmed by what I saw, but it was difficult (if you ever hear me whining again—sock me in the face). It wasn’t really a house at all. Just 4 posts with some tin on top. No walls, no floor. Her personal belongings, as well as she and her children were completely exposed to the elements. I asked her what this house means for her family. She said it meant everything. She said, Now her family could be safe and secure and they could all be together again. I’m amazed that God enables me to be a part of this. That I get to serve Him this way. I’m just amazed! Thank you for being part of it too. Without you and churches like Fellowship Baptist Church, these sorts of little miracles wouldn’t happen. Not a miracle you say. That lady sure thought it was, and she is still giving God thanks for it!